10 days after the September 11 attacks, Bruce Springsteen opened a nationally televised benefit show with “My City of Ruins,” a song that could have been a direct response to the tragedy – if it weren’t more than a year old. 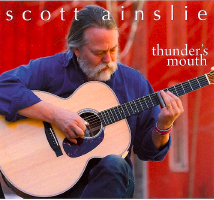 Scott Ainslie’s “It’s Gonna Rain,” the centerpiece of his new collection of originals, blues standards and a tasty Tom Waits tune, seems no less prophetic. Written several weeks before Hurricane Katrina, its tableau of a man tripping over “beer bottles and broken Mardi Gras beads” while he wanders the swamped city searching for a lost lover, is a perfect allegory for the days that followed the disaster. Another artist might have been tempted to tinker with it, but Ainslie didn’t change a word, as the world intersected with art to transform a story of broken love into the tale of a broken city. Ainslie is blues authority with a political bent, and his selection of cover songs reflects this. “Down In Mississippi,” written in the 1960s by J. B. Lenoir in response to Southern racial injustice, is given just the right balance of pain and rage. He plays “Dust My Broom” (an obvious selection for Ainslie, the author of a Robert Johnson biography) on a vintage 1931 national. The a capella version of Son House’s “Grinnin’ In Your Face” shares an edgy, unadorned sound with many of the album’s non-originals. Including “It’s Gonna Rain,” Ainslie wrote four of the album’s 10 songs. The title track is a haunting denunciation of slavery, helped by Eugene Friesen’s moaning cello and Sam Broussard’s knife-edged guitar work. “If Anybody Asks About Me” and “I Should Get Over This” are both laced with evocative African textures, sounding of the same vintage as “Another Man Done Gone,” a lovely, sad Vera Hall blues song that Ainslie learned from a John Avery Lomax field recording. Ainslie recruited a top-pedigree lineup for “Thunder’s Mouth.” In addition to Friesen (Paul Winter Consort) and Broussard (Michael Martin Murphey, Jimmy Buffett, Steve Riley), SNL Band veteran T-Bone Wolk played accordion, keyboards, guitars and percussion along with his regular bass guitar. Wolk uses the latter to great effect on “Little Trip To Heaven,” a song that will delight anyone who’s impatient with Tom Waits’ gravelly singing style. Ainslie cleans it up nicely, revealing a romantic side of the curmudgeonly songwriter. “Thunder’s Mouth” is a sturdy record, powerful both as homage and history. But most of all, it reveals a talented tunesmith shaping his unique vision to deep musical roots.